Two independent research teams report today in Science that they’ve taken key strides toward harnessing the energy in sunlight to synthesize chemical fuels. If the new work can be improved, scientists could utilize Earth’s most abundant source of renewable energy to power everything from industrial plants to cars and trucks without generating additional greenhouse gases. Today, humans consume an average of 15 trillion watts of power, 85% of which comes from burning fossil fuels such as oil, coal, and natural gas. That massive fossil fuel consumption produces some nasty side effects, including climate change, acidified oceans, and oil spills. These problems are likely to grow far worse in coming years, as worldwide energy use is expected to at least double by 2050. Renewable power sources, such as solar photovoltaics and wind turbines, aim to fill this demand, and they are making steady progress at providing electricity at ever cheaper costs. But electricity has a key drawback as an energy carrier. It’s difficult to store in large quantities, which means it can’t be used for most heavy industry and transportation applications, such as flying planes or driving heavy trucks. So researchers have long sought to use the energy in sunlight to generate energy-rich chemical fuels, such as hydrogen gas, methane, and gasoline, that can be burned anytime anywhere. And though they have demonstrated that this goal is possible, the means for doing so have been inefficient and expensive. That’s where the new advances come in. In the first, researchers led by Daniel Nocera, a chemist at the Massachusetts Institute of Technology in Cambridge, report that they’ve created an “artificial leaf” from cheap, abundant materials that splits water into molecular hydrogen (H2) and oxygen (O2), somewhat similar to the way plants carry out the first step in photosynthesis. The leaf consists of a thin, flat, three-layered silicon solar cell with catalysts bonded to both faces of the silicon. When placed in a beaker of water and exposed to sunlight, silicon absorbs photons of sunlight, generating electrons with enough energy to conduct through the silicon. The process leaves behind positively charged electron vacancies called “holes” that can also move through the material. The holes migrate to a cobalt-containing catalyst painted on one face of the silicon cell, where they strip electrons from water molecules, breaking them into hydrogen ions (H+), and oxygen atoms. The catalyst then knits pairs of oxygens together to make O2. Meanwhile, the H+ ions migrate to another catalyst on the opposite face of the silicon cell, where they combine with conducting electrons to make molecules of H2. In principle, the H2 can then be stored and either burned or run through a fuel cell to generate electricity. In the second study, a team led by chemists Richard Masel of Dioxide Materials in Champaign, Illinois, and Paul Kenis of the University of Illinois Urbana-Champaign, report that they’ve come up with a more energy-efficient approach to converting carbon dioxide (CO2) into carbon monoxide (CO), the first step to making a hydrocarbon fuel. Other researchers have worked for decades to devise catalysts and the right reaction conditions to carry out this conversion. But converting CO2 to CO has always required applying large electrical voltages to CO2 to make the change. That excess voltage is an energy loss, meaning it takes far more energy to make the CO than it can store in its chemical bonds. But Masel, Kenis, and colleagues found that when they use a type of solvent for CO2 in their setup called an ionic liquid, it reduces the extra voltage needed approximately 10-fold. Ionic liquids are liquid salts that are adept at sabilizing compounds such as CO2 when they are given an extra negative charge, the first step in converting CO2 to CO. And the Illinois researchers suspect that this added stability reduces the need for applying an external charge to do the job. “These papers are nice advances,” says Daniel DuBois, a chemist at Pacific Northwest National Laboratory in Richland, Washington, who works on catalysts for both splitting water and reenergizing CO2. But he cautions that neither solves all of their respective issues. 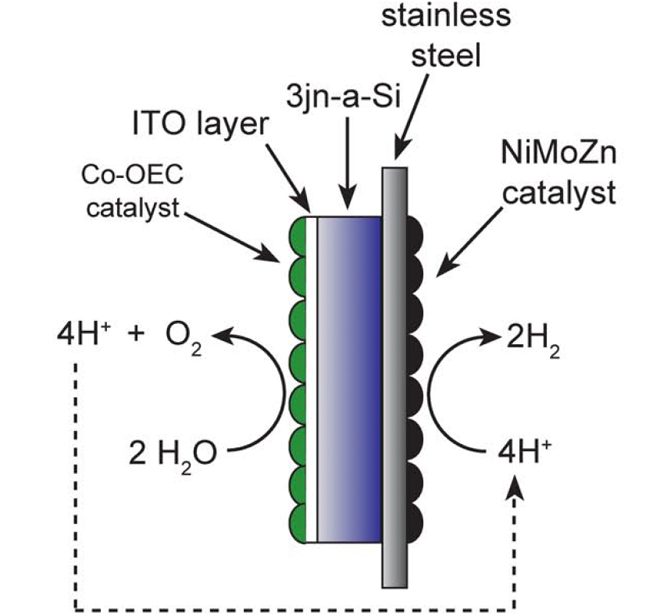 The oxygen-forming catalyst in the artificial leaf, for example, remains slow, DuBois says. And the efficiency of the overall leaf is only 4.7% at most, and just 2.3% in its most simplest design. The catalyst in the CO2 system is even slower. But DuBois says that because other researchers in the field now have a good examples of systems that work, they can now focus on designing improved catalysts to speed them up.